How to manage a simple burst effect around the perimeter of your guitar using less than zero equipment! Trace out your guitar body onto reasonably-thick card as shown below then cut out your template. Place push pins around the template at least 1" from the sides for support. Placing your template on the guitar body use pennies, nickels or quarters (washers if you genuinely are a PoorBoy) taped in tubes as weights. 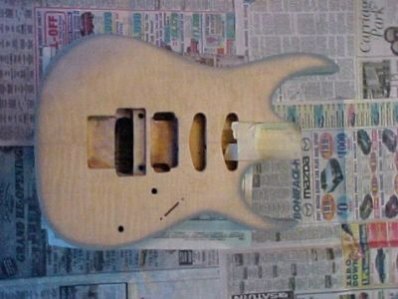 The idea here is to hold the template down on the guitar body. Be sure that the template is aligned with the edge of the body all the way around. Now you can begin to paint! Remember that you need to keep an evenly spaced view of the body as you move around. Importantly, keep the nozzle of your spraying apparatus at least 18" or more away from the template. Too close and you could bend the horns or blow it away! Also, the closer you get with the nozzle, the sharper the edge of the spray will be as it hits the body. The distance makes the burst softer. With a little practice you can do multiple colors at different depths from the edge of the body. Ever wondered how to go from a shiny metallic, bright or dark burst edge to the middle and keep relatively the same hue of translucence color on your body? PoorBoyBurst™ by Brian Calvert is licensed under a Creative Commons Attribution-NonCommercial-ShareAlike 4.0 International License.